6 min read . Updated: 20 Oct 2008, 07:18 PM IST Sruthijith K.K. New Delhi: In a small room prominently marked as a non-smoking zone inside a decrepit two-storeyed bungalow on Raisina Road, close to the Capital’s political heartbeats, Pushpendra Kulshrestha is delivering his campaign pitch. The issues seem time-worn: need for better infrastructure, more accountability, financial transparency and, of course, a better, brighter future all around. However, Kulshrestha isn’t your average politician. He is a journalist with Pakistan’s Aaj TV, the two-term incumbent secretary general of the Capital’s Press Club of India for two one-year terms and is now seeking a third term. “This press club did not even have an Internet connection," says Kulshrestha, just 24 hours before the polls were to close. “Can you imagine that? Today the club has an email address and a website." Listing his major achievements so far, he points to a new media centre at the club, complete with five broadband-enabled computers. 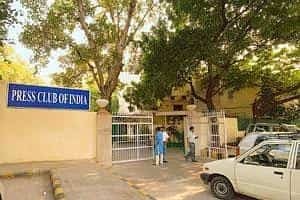 In the past few days, the normally sleepy—well, at least during the early part of the day when the bar isn’t going full tilt—press club has been a hub of enthusiastic activity as two panels and a clutch of independent candidates fight it out for the right to be on a committee that will run this 51-year old club for a year. The politics are acrimonious and for a non-press club regular, it is hard to make headway through the maze of allegations and counter-allegations, some whispered in urgent tones in the club’s corridors and others prominently displayed on the notice board as an open letter to the club’s 2,665 members who have voting rights out of a total membership of some 4,700. Mention the Press Club and it usually evokes both fond memories as well as strong reactions from the Capital’s journalists, with veteran scribes being the most pessimistic. While details and reasons vary, the broad consensus is that, somehow, it isn’t the place it used to be. “The culture has changed, honesty has disappeared from this place," said M.L. Kotru, who was the India correspondent of The Sunday Times of London and the Delhi editor of the once-influential The Statesman. Press Club lore has a way of remembering its old members. Moraes, a well-known columnist and journalist who edited both The Times of India and the Indian Express in the 1950s, is remembered for his affinity for Black Dog Scotch whisky. It appears that almost every journalist who has worked in Delhi before the late 1990s has a Press Club story or two. “It was the hub, it is where you could see the big editors, you learnt the tricks of the trade from senior reporters, got inside gossip about politicians and many people would get introduced for a job. All that is gone, now people just come and drink," said a senior reporter with a national daily who is reluctant to be named. He attributes the change to the fact that journalists have become relatively more affluent. “When journalists migrated from a kurta to a suit, they also moved out of the Press Club." It might be partly the reason, said Chandan Mitra, editor-in-chief, The Pioneer. “I used to go regularly in the mid 1990s, and it was a wonderful place to meet friends, have a drink and have great discussions. When I was with The Times of India, there was this annual tradition. On the budget day, after the budget editorial was written and cleared by the editor, the great Girilal Jain, he would take us all to the Press Club. That night, he would pick up the tab for all of us." But despite the fond memories, Mitra says he stopped going to the Press Club by the late 1990s. “Something happened," he said. “The journalists became sharply divided along ideological lines. The discussions were no more stimulating; there were only heated arguments that regularly came down to a verbal brawl. It wasn’t fun any more." Still, for many regulars, the location of the club makes it a very attractive place to meet sources, friends and colleagues over rather reasonably priced alcohol and food. It’s close to the offices of newspapers and wire agencies that are located in and around Connaught Place. It’s not far from New Delhi’s Fleet Street, Bahadur Shah Zafar Marg, where several newspaper offices are located, and it’s close to Parliament and important Central government office complexes such as South Block, North Block, Shastri Bhawan and Rail Bhawan. While the food is nothing to rave about, say insiders, it is the bar that remains a real deal. Christuraj Babu, a bar tender from Kerala who has served drinks to generations of journalists since 1972, says little has changed along the way. Except the price and the brands. “Most people drink whisky, that has not changed," he says in Malayalam. “Those days, the beer was Golden Eagle, which was Rs3.50. Aristocrat and Director’s Special were popular. Now people drink Blender’s Pride." A bottle of Kingfisher beer is now priced at Rs65 and a pint can be had for Rs40. A “large" Blender’s Pride is for Rs50, perhaps among the cheapest pegs in Lutyens’ Delhi. For the stereotypical big-drinking journalist, though the stereotype may have worn thin, the Press Club remains a perfect watering hole. The building housing the club was a rest and relaxation facility for soldiers during the World War II, called the Raisina Mess, part of the army barracks. The wooden-floored conference hall on the first floor used to be a dance floor, according to Kotru. The club even had a Scotch licence, which meant it could import a small quantity of Scotch directly from Scotland. Kotru has a wealth of anecdotes from that era, about Morarji Desai, Indira Gandhi, C.N. Annadurai, assorted ambassadors and foreign secretaries. “Jawaharlal Nehru came, all the prime ministers would come, all the important ministers would hold press conferences there," he says, adding he is deeply saddened by what the club has become: “a watering hole". Those contesting the elections claim they are aware of this feeling and down to the last candidate promise that, if elected, they will restore at least part of the club’s former glory. Lucy Chattopadhyay, a broadcaster with All India Radio and a member of the managing committee, is contesting to become the treasurer. “If I get elected, I’ll become the first woman treasurer," she said, heading into the election weekend. While she confesses she is not entirely familiar with the club’s finances, she remains confident of doing a good job. What have been the achievements of the incumbent managing committee? “We gave off to all our staff on Labour Day, and the office bearers ran the club. I worked at the bar," she said. Anything else? “Oh yes," she said after pausing for a moment, “We celebrated Christmas for the first time. Forty kilos of cake was distributed and the members were very happy that we were celebrating Christmas." Postscript: Even though voting took place on Saturday, the Press Club journalists spent much of Sunday arguing about how to count the votes and trading charges over alleged violations of established counting procedures. While counting did resume Sunday evening, as Mint went to press, the fate of Kulshrestha and Chattopadhyay was still up in the air.